Almost two months ago, my life changed forever. | .durban.single.parent.male. Almost two months ago, my life changed forever. 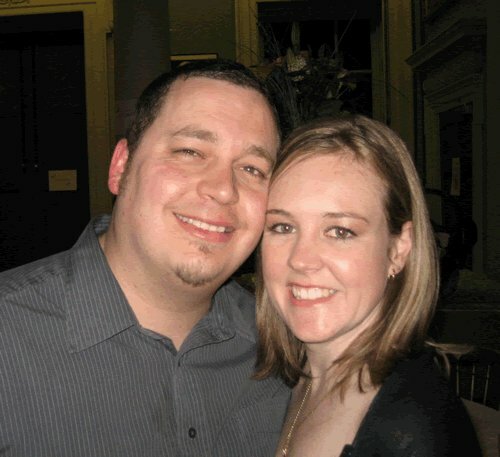 A picture of ours I love, taken in England back in 2007 at our friends Ben & Kelly's wedding bash. Except, as many of you now know, she did. Not long after this exchange, Janie started a new job at a company called Gorilla Creative Media. The offices are located in Umhlanga, and as many of you who are familiar with the whole Durban area know, Waterfall is a long ways away from there. The commute was not a nice one, having to snake her way from Waterfall to Kloof to the M13, then get on to the N3 and finally the N2 in that charming morning traffic of ours. Soon after starting at Gorilla, Janie began to complain of headaches. She went to see the doctor who thought it was likely something to do with her eyes. So, she went to the optometrist, and sure enough, she had astigmatism. She was prescribed glasses, and for a short while found relief from the headaches. But they came back. Persistent, pressing, gnawing headaches. Not always bad, just… there. She felt them there almost all the time. But they weren’t debilitating, and after all, the job was challenging and she had a long commute every day, so we chalked it up to stress and left it at that. Janie awoke at 4:30 in the morning on Sunday, 12 June with a migraine. She was in agony, and woke me to say she was in terrible pain. I massaged her neck, which seemed to settle her, but the pain carried on and she couldn’t get out of bed. The babies were confused when they came in later, so I ushered them out of the room and put on the TV, made Janie some tea and hoped it would pass. By noon, the migraine was still firing away, so I called Janie’s sister, Philippa, and asked her to come and look after the kids while I took Janie to the hospital. The doctor on call at the hospital gave Janie some pretty powerful painkillers intravenously and told us to call a neurologist first thing the next morning. The painkillers helped some, but Janie could still feel the headache in there, just waiting for the drugs to wear off. The doctor also prescribed some pill form painkillers to help Janie through the night, which we would later discover didn’t do much at all. Janie was immediately sick as soon as we arrived home from hospital. On Monday morning, the 13th, I called the neurologist at the hospital, only to find out the waiting list to see him was two weeks long. I went to our doctor’s office here in Waterfall to ask what could be done, and they told me to bring Janie in. Her doctor ran a test on her and determined she needed to see the neurologist, that day. He pulled some strings and we were waiting to see the neurologist at Westville Hospital that afternoon. He ran the same test our doctor had run on Janie, and determined she needed to be checked in to the hospital for observation, just in case she had had a stroke which was causing the weakness in her left side and the headaches. He ordered an MRI for the next day, and we went downstairs to check Janie in. So now we are up to Tuesday, 14 June. I went down to the hospital early to hang out with Janie. I stayed and we eventually went down to the X-ray people to have her MRI done. Once finished, we went back up to the ward and I sat with Janie and we talked. I might have left at some point, the details are blurry. Later on that afternoon, the neurologist came to the ward and asked us to come over to a computer screen by the nurses’ station. And we saw it. A tumour, in the right side of the brain, large and round and black against the grey of the brain matter on the scan. The neurologist said it could be a cyst, perhaps a tumour or brain cancer. But there it was. The room spun and I felt my legs were going to give way, but I put my arm around Janie and we walked back to her bed. We both cried and prayed and hoped for the best. The neurologist handed off the case to a neurosurgeon, who in short order upped Janie’s pain meds and ordered a drip that would bring the swelling on the brain down. Janie began to feel better for the first time since this whole ordeal began. The neurosurgeon informed us that he would operate on Janie’s head on Friday. He would transfer her from Westville Hospital to St. Augustine’s in Durban for the procedure. And so it was. The surgery took place on Friday, 17 June at 7:00 am. The doctor removed a cyst on her brain, but also discovered a brain tumour, what is known as a type-2 glyoma, or slow advancing malignant brain tumour. He said that as far as malignant tumours go, this is the one to have. It could be controlled with chemotherapy and radiation. He felt her prognosis was good: she was young, healthy, had so much to live for. She would likely make it. And for a few days there, we all thought she would, too. Visits on Friday, Saturday and Sunday were all positive. She was off the ventilator by Saturday, was talking and interacting well. A bit emotional, and sometimes there would be a small seizure on the left side of her body, but I just put that down to the fact that she’d had her brain drilled into. Sunday’s was so encouraging. She really was herself. She looked great, she was cracking jokes and being Janie. At around 7am on Monday morning, as I was preparing to take the kids off to school, I received a call from the ICU. At 5:30 in the morning, Janie had stopped breathing. Her left pupil was fixed and dilated. She had had a massive seizure, and they had intubated her again and she was on the ventilator. I was to come down immediately. After dropping off the kids, I went to my mother in law’s house, and she, Philippa, myself and my mother went down to the hospital. We spoke to the neurosurgeon. He showed us a scan they had just performed: the tumour had jumped from the right to the left hemisphere. Her brain as swelling out of control. If it could not be brought down, her brain would be crushed within her skull. All day we waited and prayed and watched the machine gauging her cranial pressure. Up and up and up it went. Slowly, the realization began to dawn on us all: Janie was not going to make it. That evening, we all went home knowing that there was no hope. Janie was pronounced dead on the morning of 21 June, a full eight days after she first checked into Westville Hospital. So that is the story. It is the heartbreaking launching point of this new phase in my life. It is also the single most monumental event of my 35 years. It brought the curtain crashing down on nearly nine years of marriage, a full 13 years of my blessed acquaintance with her. The pieces to pick up are everywhere. Were it not for the incredible love and support of Janie’s parents, Alan and Sue Spence, her sisters Philippa and Andi, my parents and brothers and wonderful friends like you, I would have despaired and thrown in the towel right away. I have not yet, and that is a credit to them, to you. But there is hope. And there is life. And yes, life carries on. Janie invested so much in me, and it is starting to blossom now, even in the midst of this catastrophe. And I can make it as a single father. I have the two most wonderful babies, and I will need to become whole again for them. And I will be. Eventually. Dear Phil… I read, I wept and I smiled. You will make it and there are so many of us rooting for you. Thank you for sharing such an honest, true and heartfelt message. I will be following your blog as a tribute to you and Janey and also will know what to pray for. Querido Phil, meu coração chora junto com você e sua família e ao mesmo tempo se alegra e emociona ao ver seu testemunho de fé, amor, paixão e vida! Tenho certeza que seus filhos serão pessoas incríveis, pois além de todo amor, carinho e dedicação que receberam da mãe eles tem você como maior exemplo de vida! Phil your strength is amazing and leads me to the throne of the Most High. No man who loves like you do could have survived this without the strength that comes through the Messiah. Praise His Name! Baruch Hashem! You are looking towards healing and claiming a legacy and an inheritance for your children, through your most precious wife. My prayers are with your family. Phil, thank you for sharing this part of your story. I can imagine how hard it was to write this all down. My heart aches for you friend! I have been thinking about you and praying for you. My prayer is that the Lord God Almighty would heal your wounded soul and in the midst of all this give you the strength to be a God glorifying father. Phil, thank you so much for sharing this part of the story. I know that for alot of us that are far away, I for one was shocked and confused how it seemed to happen so suddenly. I know now that it was something that you and Janie were dealing with for a while. However I know that reliving it must’ve been extremely hard. I consider myself to be so blessed, having been with you and Janie in ’98, watching your love blossom. She will be forever missed and loved by so many. I know that you will continue to be an amazing dad, giving Sean and Sophie more love than most single mortals could muster 🙂 I pray for your strength and patience almost on a daily basis, Phil. My love to you, dear friend…. Thanks for sharing- we love you, Phil. Thanks for sharing this Phil. Your courage is a testament of your character, love, and devotion. PTL for your babies who are blessings and will be a great source of joy to you as you care for them and watch them grow. You are loved. Being the typical analytic nurse, I had wondered what had happened. Thank you for sharing your story. I keep you and your family in my prayers. I keep the picture of Janie where I can look at it every day. She is an inspiration. I enjoyed meeting your parents at the memorial service. You remain in our hearts. Thank you for posting this blog and wonderful tribute to your wife! The story was hard to read and there were many tears, but it helps to know that the Lord is on your side and He will walk through this with you! Jane impacted so many lives, whether through long friendships or short periods of seeing you two fall in love and will be forever missed. I know that so many people around the globe have you and your beautiful children in their prayers, as do we here in Australia! You are an amazing person and a wonderful dad to those babies!! Many blessings!! Thank you so much for sharing. My prayers and love are with you and the babies. Love you and the children. Miss Jane so much. I know you don’t know me, but nevertheless wanted to express how sorry I am to hear of your loss. Nothing can take away the sting but I do pray that God will amaze you with all that your heart (and your children’s too) needs right now. Thank you, Yolanda. I am looking at your blog, I really like the layout. I’m new to this, so with your permission I’m going to subscribe and check out how you do things and likely do things somewhat in a similar fashion. I hope you are well, and God bless. Phil, my heart is for you & Sophie & Seanie & your families. Your blogs evoked many emotions in me (I read them in reverse order). Heavy tears when my wife came into the room as I was finishing your first blog about Janie. We are expecting our 1st child, a girl, and “Sophie” has always been one of top 4 choices for a name. I hope we get to visit SA oneday & see you & your kids. May God comfort you with a comfort that only He can give you.